Home » What is Unitarian Universalism? Unitarian Universalism is a liberal religion with Jewish-Christian roots. It has no creed. It affirms the worth of human beings, advocates freedom of belief and the search for truth, and provides an open, supportive community for people who believe that ethical living is the supreme witness of religion. As Rev. Barbara Wells ten Hove explains, “The Unitarian Universalist principles are not dogma or doctrine, but rather a guide for those of us who choose to join and participate in Unitarian Universalist religious communities.” While each person exploring Unitarian Universalism might come back from a different background and be on a different path, these principles form a common ground. The inherent worth and dignity of every person. We believe that each and every person is important. Justice, equity and compassion in human relations. We believe that all people should be treated fairly and kindly. Acceptance of one another and encouragement to spiritual growth in our congregations. We believe that we should accept one another and keep on learning together. A free and responsible search for truth and meaning; We believe that each person must be free to search for what is true and right in life. The right of conscience and the use of the democratic process within our congregations and in society at large. We believe that all persons should have a vote about the things that concern them. The goal of world community with peace, liberty, and justice for all. We believe in working for a peaceful, fair, and free world. Respect for the interdependent web of all existence of which we are a part. We believe in caring for our planet Earth, the home we share with all living things. Read more about the Unitarian Universalist Principles. In 1961 the Unitarian Universalist Association was formed from two traditions: the Universalists, who organized in 1793, and the Unitarians, who or ganized in 1825. Both groups trace their roots in North America to the early Massachusetts settlers and to the founders of the Republic. Overseas, their heritages reach back centuries to pioneers in England, Poland, and Transylvania. Each of the 1,047 congregations in the United States, Canada, and overseas are democratic in polity and operation; they are held together by covenant and govern themselves. Headquartered in Boston, Massachusetts, the Unitarian Universalist Association works to advance its principles and serves local congregations by providing staff, services, and resources. A great place to learn more about Unitarian Universalism is UUWorld , which celebrates liberal religion and the people it inspires. Meet extraordinary individuals, see how Unitarian Universalist communities put their values into action, and explore the ideas and traditions that ground them. The print and digital magazine is published quarterly, and news and original online-only content is published weekly. 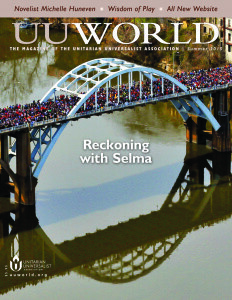 Members of Unitarian Universalist congregations in the United States receive a print subscription as a benefit of membership.